Boing Boing blogged this under the heading "Bitter plaque flays dead mom for misanthropy." You spent your life expressing animosity for nearly every person you encountered, including your children. Within hours of his death, you even managed to declare your husband of fifty-seven years unsuited to being either a spouse or a father. Hopefully, you are now insulated from all the dissatisfaction you found in human relationships. Mona's SSDI entry is here. It looks like it might be a plaque on a tombstone.. if so..wow! 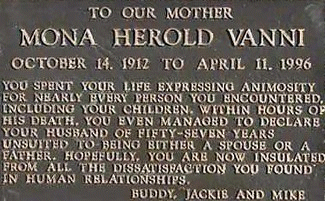 I suspect that a Guido Vanni was her husband. Yup, it looks like Guido was the guy. And I wonder if he was the 8-year-old Guido Vanni who arrived at Ellis Island aboard the S.S. Guiseppe Verdi from Genoa on Mar. 22, 1921 (line 8 on both pages). How very sad that it came to this. As a son, I can't comprehend how anyone could publicly (albeit posthumously) embarrass his mother like this. 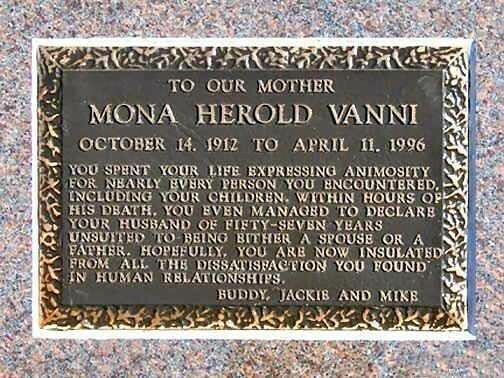 As a genealogist, I kind of wish one of my distant ancestors had a stone like this. There are plenty of people who deserve the sentiment, but not many forced to bear it for eternity. I wonder if the children in this case have any regrets.